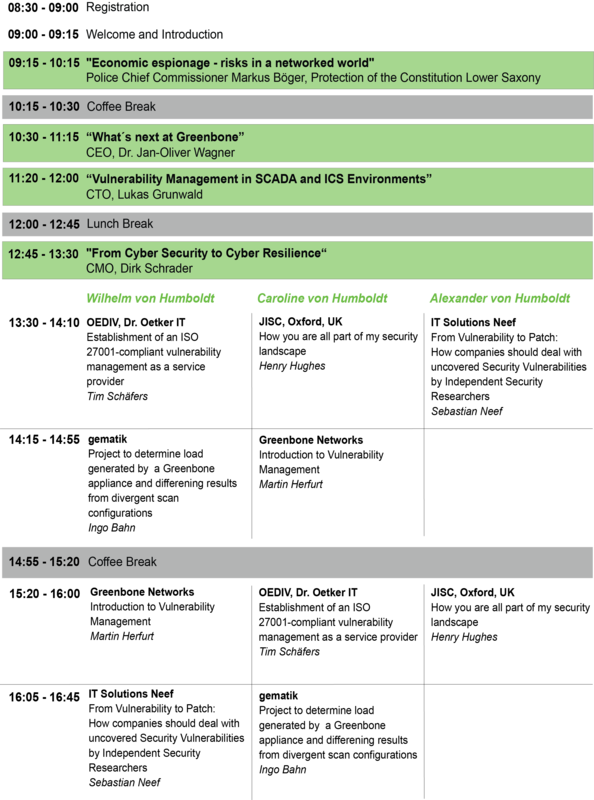 “Security Transparent” is the Greenbone user conference for sharing experiences and insights with the Greenbone technology. This year, the event is hosted at the heart of Berlin right between Gendarmenmarkt and Unter den Linden, in the equally historical and elegant venue Humboldt Carré, on May 8, 2018. Panel discussion with users from health services, utilities, authorities, education and economy. Workshops and presentations from and with Greenbone users. The name of Greenbone’s annual user conference is setting the standard for it as well as it is indicating its program. Transparency about vulnerabilities in an IT infrastructure and the transparancy of our solution are directly related to the fact that only a transparent approach to the danger of vulnerabilities can reduce the risk. That is the way our conference is arranged. It is a platform for the exchange of kowledge and experience among our users and those interested in becoming one. Interactive insights into our roadmap are shared, and all particpants can chat to the Greenbone team and some of our technology partners about current and future functionalities. Dr. Jan-Oliver Wagner, CEO at Greenbone: What’s Next at Greenbone?